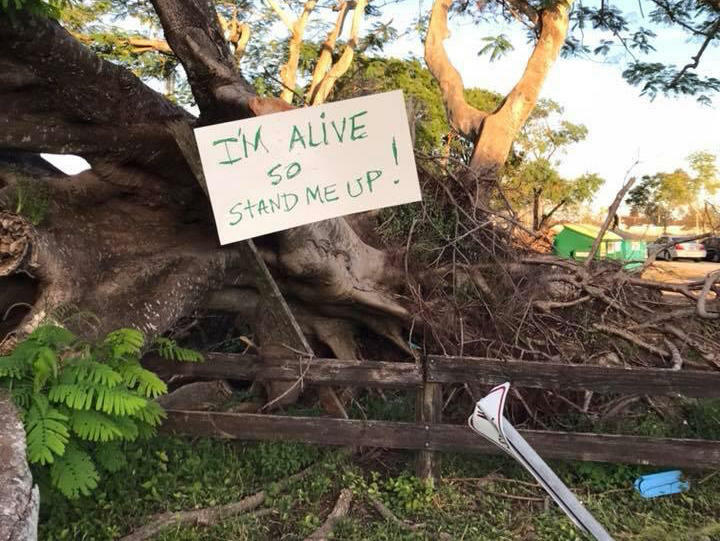 A homemade sign begs help for a downed tree in Kendall's Devon Aire Park, two months after Hurricane Irma swept through South Florida. In this interview, Hunsberger talks to WLRN’s Christine DiMattei about what makes certain downed trees unrescuable. WLRN's Christine DiMattei talks with Adrian Hunsberger, Urban Horticulture Agent with UF/Miami-Dade County Extension Office. HUNSBERGER: Unfortunately, if a tree has completely fallen over -- unless it's a young tree or something that's been recently planted -- it's probably best to have that tree removed. It could be technically alive, but it can become a hazardous tree in the future. If a tree came down in a Category 1 storm, it would never get strong enough to withstand another Category 1. It could blow over in a tropical storm. It could even blow over in a thunderstorm. Who can people call for help in determining whether trees can be saved? They can call their local extension office. Or if they’re in Miami-Dade County, they can just call 3-1-1. What exactly is South Florida’s “tree canopy” and why is preserving it so important? A canopy of a tree is the above-ground portion of the tree that has the leaves. It provides cooling. It helps sequester carbon dioxide from the atmosphere. It's aesthetically beautiful. There are many many benefits of having a tree canopy. Is there any way to keep track of how many potentially healthy South Florida trees are hauled away as garbage in the aftermath of a storm? I don't think it's physically possible. But as far as street trees and trees in parks and natural areas, there are arborists – or if it’s a parks department – they do try to keep tabs on at least the trees that have survived after a hurricane. Maybe also some of the trees that have been removed. And for the trees that are planted on a right-of-way, a lot of the municipality’s arborists will go out and assess if they’re likely to become unsound trees in the future – trees that could cause personal injury or property damage. If you need help with a downed tree, click here for a link to a map of county UF/IFAS Extension offices.